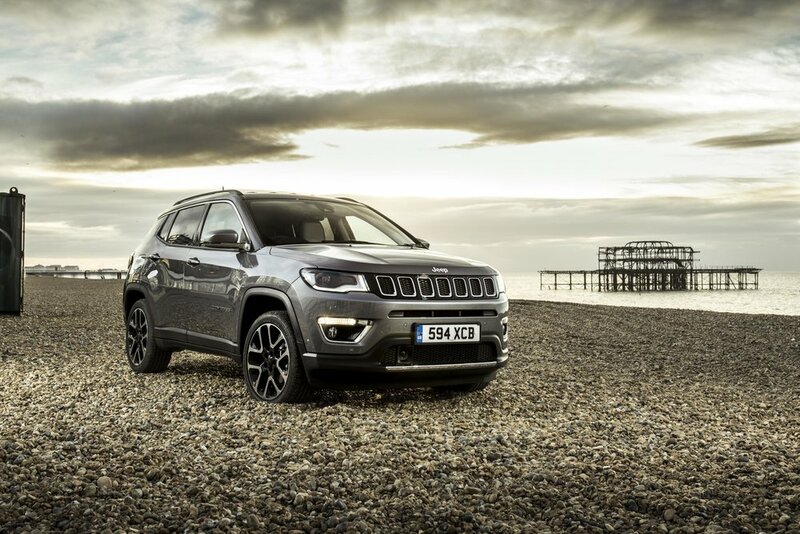 Pricing and specification for the all-new Jeep® Compass have been announced by Fiat Chrysler Automobiles UK, ahead of the stunning new SUV’s arrival here in February 2018. The new vehicle represents a key addition to the Jeep line-up, allowing the brand to tackle the important and growing compact SUV segment, that is expected to grow by almost 20 percent to 7.5 million in 2020. In Europe alone, this segment amounts to more than 1.6 million and is expected to achieve more than two million units by 2020. In the UK, the Compass range is powered by two petrol and three diesel engines. The petrol engine offering includes a 1.4-litre MultiAir II Turbo engine with Stop&Start delivering 140 horsepower at 5,000 rpm and 230 Nm of torque at 1,750 rpm in combination with the six-speed manual gearbox and 4x2 configuration, and the 1.4-litre MultiAir II Turbo engine producing 170 horsepower at 5,500 rpm and torque of 250 Nm at 2,500 rpm, paired to the nine-speed automatic transmission and 4x4 configuration. The diesel engine range comprises the efficient 1.6-litre MultiJet II with Stop&Start delivering 120 horsepower at 3,750 rpm and 320 Nm of torque at 1,750 rpm, paired to the six-speed manual gearbox and 4x2 configuration, and the 2.0-litre MultiJet II with Stop&Start delivering 140 horsepower at 3,750 rpm, with the six-speed manual transmission, producing 350 Nm of torque at 1,750 rpm and come with the 4x4 configuration. A higher output version of the 2.0-litre MultiJet II with Stop&Start – delivering 170 horsepower in combination with the nine-speed automatic transmission and 4x4 configuration (including the Trailhawk specific low range mode) – completes the diesel offering available on the all-new Compass. Four equipment levels of Jeep® Compass are offered in the UK: Sport, Longitude, Limited and Trailhawk*. The Sport version’s standard equipment includes 16-inch alloy wheels, LED tail lights, leather steering wheel with audio controls, air conditioning, cruise control, forward collision warning and 60/40 rear seat split. Longitude specification adds 17-inch alloy wheels, front fog lamps, Parkview reverse camera, Apple CarPlay and Android Auto functionality, 8.4-inch audio and navigation, electric lumbar support, dual zone climate control and keyless entry and go. Limited equipment includes 18-inch alloy wheels, halogen projector headlamps, silver roof rails, privacy glass, leather power and heated seats, windscreen wiper de-icer, heated steering wheel, rain sensitive wipers, Parkview reverse camera, Parksense front and rear park assist system, blind spot and cross path detection, and parallel and perpendicular park assist. Trailhawk equipment includes halogen projector headlamps, hood decal, red rear tow hook, privacy glass, front and rear off-road bumpers, raised off-road suspension, front and rear skid plates, 8.4-inch audio and navigation, leather power and heated seats, 60/40 folding rear seat with boot pass-through, heated steering wheel, all-season floor mats, Parkview reverse camera, Parksense front and rear park assist system, blind spot and cross path detection, hill descent and Rock transmission mode. Jeep designers have given the legendary seven-slot grille a fresh look by setting each of the individual chrome slots in a Gloss Black field. LED signature headlamp bezels featuring a black outline add personality and attitude to the face of the all-new Jeep® Compass. An optional dual-pane sunroof designed to maximize surface and headroom delivers the open-air freedom that belongs to the Jeep brand. A standout feature of the rear of the Compass is its unique LED tail lamps: slim and rectangular in shape, the tail lamps flow into the tailgate for a commanding yet premium appearance instantly recognizable as a Jeep Compass on the road or trail. Jeep Compass is the first Jeep SUV to offer the new Uconnect system, delivering communication, entertainment and navigation features that enhance both the driving experience and the passengers’ onboard comfort. Jeep Compass is equipped with the Uconnect 5.0 and Uconnect 8.4 NAV systems. Both have been improved to include easy-to-use features, enhanced processing power, faster start-up times and touchscreens that display high-resolution graphics. These new features significantly enhance the user interface providing a high definition screen with pinch and zoom capability and a customizable menu bar, using the Drag and Drop feature on the Uconnect 8.4 NAV. Functions of the new Uconnect system also include hands free calling, navigation and text-to-talk features with natural language voice recognition technology for a safe, comfortable and connected everyday driving experience. Driver and passenger safety were paramount in the development of the all-new Jeep® Compass, which attained a 5-star Euro NCAP score. The car offers more than 70 available active and passive safety and security features including Forward Collision Warning-Plus, LaneSense Departure Warning-Plus, Blind-spot Monitoring and Rear Cross Path detection, ParkView rear backup camera with dynamic grid lines, Automated Parallel and Perpendicular Park Assist, Adaptive Cruise Control, electronic stability control (ESC) with electronic roll mitigation and six standard air bags. *Trailhawk version available summer 2018.